Discover what color contacts for astigmatism are available on the market and at what price. Years ago, it was difficult for someone with astigmatism, where the cornea has an irregular shape causing blurry vision, to wear contact lenses. My brother tried for months to wear contacts, but his astigmatism was so bad, he just had to give up. Being vain and trying to "get the girls," he didn't even bother to wear glasses when going to nightclubs. Strange how many girls he asked out, only to find they weren't quite as pretty as he remembered in the nightclub! But advances in technology means that astigmatism sufferers, even those like my brother with severe cases, can wear contact lenses. And TORIC lenses, as contacts for astigmatism are known, are also available with colored tints, for people who want to change the color of their eyes. For most people, the most comfortable lenses are soft ones, especially the disposable variety which don't require a complex cleaning and disinfecting regime. The problem with an astigmatism prescription, is that it has to allow for correcting the curvature of the eye (the astigmatism) and also cure any short or long-sightedness. This means your prescription will have numbers for base curve (BC) and diameter (DIA) plus a cylinder number (CYL) and an AXIS number (the astigmatism part of the prescription). Sadly, there aren't many disposable toric soft lenses available in a wide range of cylinder shapes and when it comes to color contacts for astigmatism, there is even less choice. 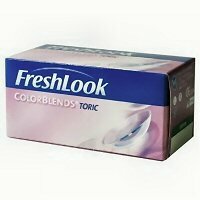 There is one disposable colored contact lens, however, for astigmatism sufferers, in fact the only disposable lens currently available, and it's called Freshlook Colorblends Toric. Freshlook Colorblends Toric is available in 4 different colors - blue, gray, green and honey - far fewer than ordinary Freshlook colorblends which come in 12 different shades. They are supposed to suit either light or dark eyes as they change rather than enhance the natural eye color, but several online reviews say that if you have very dark eyes, the contrast in color is not that noticeable. The other problem is that there are only 3 cylinders available (-0.75, -1.25 and -1.75) so you may not find your prescription available. But if you can find your prescription, as they are the only disposable toric colored lens available right now AND they don't cost the earth at only just over $16 per pair, they are cheap enough to buy for a test. Your other option for toric contact lenses with a color tint is to go for a soft lens that can be worn for a year or more. The price is much more expensive but you do have a far wider range of cylinder shapes and axis numbers to choose from. Durasoft 2 Optifit Toric Colors are priced at just over $127.00 PER LENS at AC Lens, a discount of 30% against the recommended retail price. They come in 4 colors with a CYL up to -5.75 and an AXIS from 0 to 90. There are other color contacts for astigmatism options available from the Durasoft range too.